Alongside my colleagues James Taylor (University of York), Åsa Berggren (University of Lund, Sweden) and Nico Dell’Unto (University of Lund), I am co-organising a session at the 2016 Computing Applications in Archaeology conference in Norway at the end of March/early April. James, Åsa, Nico and myself have been working together for many years now, debating the philosophical dimensions of digital technologies for archaeological practice, yet regularly finding that the practicalities of these tools tend to eclipse meaningful critique of their implications. and, so, how they shape not only our thinking, but our ways of being-in-the-world—are matters that habitually go unspoken. The trend to value the technical above the theoretical is one that is seen across many disciplines, made worse by the fact that it tends to betray itself again and again as any new piece of gear is added to disciplinary toolkits. The CAA itself, with its moniker “Computer Applications and Quantitative Methods in Archaeology”, hints at the predicament, as applied methodology is foregrounded, and richer qualitative analyses of the digital are trapped on the backstage. Despite this, the CAA has consistently encouraged discussion on the theoretical implications of the ‘digital turn’ in archaeology and the heritage sector, and for more than a quarter-century now, a host of associated individuals has attempted to push back against any ‘atheoretical’ disciplinary tendencies (see, recently for example, Hacιgüzeller 2012, Huggett 2015, Watterson 2014, among others). 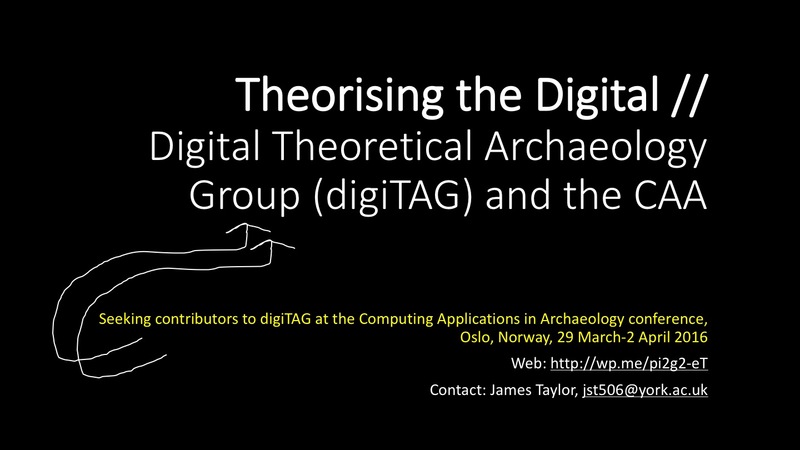 It is with these efforts in mind that we launch the first digi-TAG (Digital Theoretical Archaeology Group) session. Digi-TAG seeks to draw the power of the TAG (Theoretical Archaeology Group) enterprise – with its concern for sustained, engaged, collective and provocative theoretical discussion of archaeological issues – together with the CAA, the primary forum for the showcasing and discussion of digital technologies in archaeology. While digi-TAG is by far not the first manifestation of digital critique within TAG (e.g., Daly and Evans 2006, which emerged from TAG 2000), we see it contributing to a larger, lasting campaign of critical knowledge construction around digital archaeology/heritage that eventually embeds itself into standard practice. Right now, such critique still seems to be pursued at a limited, individual level, arguably thus circumscribing wider intellectual and structural change. We also welcome comments and queries by email, so please do connect with us. We are keen to nurture digiTAG into a long-term affair, hence we encourage your input and direct involvement in this process. Hope to have you join us in Oslo next spring! Theorising the Digital: Digital Theoretical Archaeology Group (digiTAG) and the CAA. Computing and the application of new digital technologies in archaeology and the heritage sector more generally have been advancing rapidly in recent years. This ‘digital turn’ is reflected in the growth and success of the CAA international conference, and in the emergence of a range of dedicated interest groups and associated digital outputs around the world. In concert, pressure has been increasing to situate the application of digital technologies within a wider theoretical framework, and with a degree of critical self-awareness, thereby allowing for rigorous evaluation of impact and disciplinary change. This is something that the CAA, as a nexus for the discussion of applied digital technologies in archaeology, has explicitly addressed throughout its history, and particularly in recent meetings, with a range of round tables and theoretically-engaged sessions that have proved popular amongst the digital community. TAG, another well-established conference, with a long history of fostering progressive and critical debate in archaeology, has never explicitly aimed to address the various theoretical consequences of the digital turn. As such, this session seeks both to broaden the TAG family to attend to the rapidly-growing computational sphere of archaeological practice, and to work with the CAA to consolidate its own efforts to theorise and encourage critique and evaluation of the effects of the digital turn. We invite participants to deliver papers that question, challenge, appraise and reconceive the epistemological and research-oriented implications of the digital turn—as well as its larger social, political and economic consequences. In short, what is the actual impact of the digital turn upon archaeology and the wider heritage sector? The session will culminate in a chaired discussion amongst all contributors, with a focus on both debating the future of the concept of ‘digiTAG’ and rethinking critical engagement with digital practice in archaeology and heritage overall. I’m excited to announce that we’re planning to host an in-person and online event on digital media and visual ethics in conjunction with the next American Anthropological Association conference in Washington, DC, 3-7 December 2014. This is a bit of an experimental adventure for the Society for Visual Anthropology – and an extension of our long-running visual ethics panels – so we’re looking forward to developing it and watching it evolve over the next 9 months and into the future. Details on the event are below. The deadline for proposals is 5 April 2014. Please email your proposals to me, and don’t hesitate to contact me with queries. More than ten years ago Gross, Katz and Ruby published Image Ethics in the Digital Age, a pioneering volume whose topical concerns – privacy, authenticity, control, access and exposure, as related to the application of visual media – are arguably just as salient today, if not more so, than in 2003. The ethical dimensions of image use within digital cultures are necessarily fluid and complex, driven by practical needs, institutional frameworks, related regulatory requirements, specific research and intellectual circumstances, not to mention individual and collective moral tenets. The nature of visuality itself has also been extended via digital technologies, therein further complicating our interactions with and applications of visual media. Ethical practice here, then, tends to be necessarily situated, depending upon recursive reflection and constant questioning of one’s research processes, objectives and modes of engagement. (2) an open, live-streamed presentation and discussion session at the AAA meetings in Washington, DC in December where various contributors to the blog will present either on-site or via Google Hangouts, and contribute in real time to reflections/direct commentary on the online forum itself. The former will provide a stable space within which ethical debates can be added to and developed in the lead up to, during, and after the 2014 meetings. The latter offers a concentrated opportunity to channel the collective wisdom of participants (both at the meetings and online) into the negotiation and rethinking of ethical visual practice in the digital world. For those interested in participating, please provide a brief description (max. 150 words) of the particular scenario or issue you wish to contribute to the session as soon as possible, and by 5 April 2014 at the latest. You will also need to indicate whether you plan on presenting in person or via Google Hangout at the AAA meetings in December. Decisions will be made by 10 April, and contributors will need to register for the conference via the AAA’s web-based system by 15 April. All correspondence should be sent to Sara Perry. The session will take the form of a series of brief, 10-minute presentations by participants, culminating in an extended period of group discussion and debate. Contributors will be expected to submit content for the webpages by the beginning of September 2014.